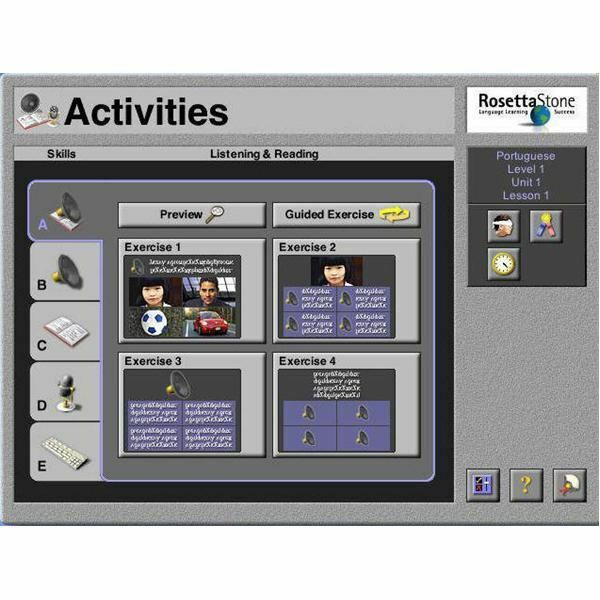 Rosetta Stone Level 1 Brazilian Portuguese uses the Dynamic Immersion method to teach language in much the same way you learned your first language: through the association of objects, actions, and ideas with words both written and spoken. This method requires active participation, and all lessons are taught in Brazilian Portuguese. Don’t worry. Go with the flow. 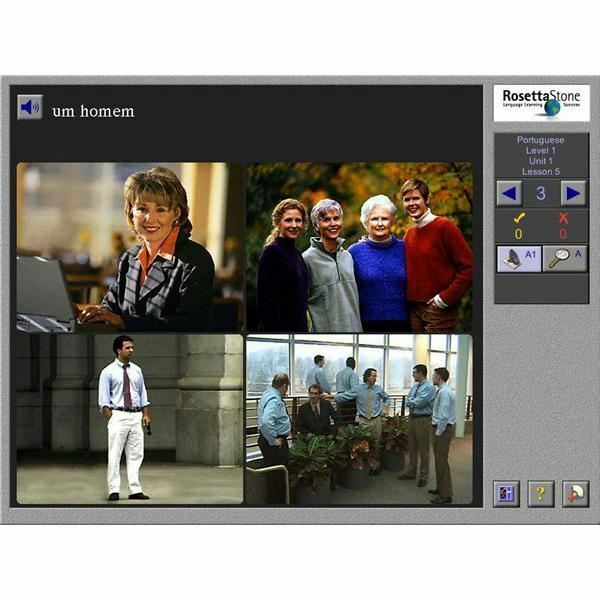 The software covers reading, comprehension of what you read and hear, and speaking in very subtle and great ways. Just follow the examples in the exercises. Grammar? You can’t go wrong. You won’t even know it’s there. Learning really is a painless process. Installation was easy with a broadband connection on a PC loaded with Windows. After I inserted the Application disk, the activity light on my computer flickered and then stopped. Since it had finished doing whatever it was doing, I exited out of the Add Software screen. Hidden behind it was the Installation shield for the program. From here I followed the Next buttons, and very quickly Rosetta Stone Level 1 Brazilian Portuguese had its icon on my desktop. Note: The yellow disk in the white envelope with the round transparent window was titled “APPLICATION / v.2.1.5.3A.” It would be nice if the yellow disc also said “Installation and Setup” on this disk. Convenience. One of the really nice features is the option to use the entire screen or just a part of it to run the application. Alerts for correct and incorrect answers show up as icons. You can choose a check mark for a correct answer and an X for an incorrect one. If that doesn’t suit you, you can choose a big yellow smiley for a correct answer and a smiley with a bar across it for a goof-up. Sound options for icons. I chose a strummed harp for correct answers (I can do no wrong!) and dungeon music (My doom awaits me!) played on a pipe organ for mistakes. Vivid, colorful photographs (see image, right) showing events, objects, people, and actions are used to teach language as we first learn it, through observation and imitation, induction and deduction, correlation, and pattern sequence. Progressive Grammar for Beginners. You acquire grammar skills at the first level through sentence examples – only in Level 3 do you study grammar explicitly for the highest levels of effective communication in Brazilian Portuguese. Speaking Brazilian Portugese. You can measure how close your pronunciation comes to that of a Brazilian speaker. Let me clarify that: how close your pronunciation comes to the Brazilian speaker in the example. There is room for variation, but you know you are on the money when the dial goes into the green zone. In the yellow zone, it is good to very good. If you are in the red zone, then you need to practice, practice, practice. From Unit 1, Lesson 1 to Unit 8, Lesson 12, this language software consistently gives a well structured lesson with examples from previous lessons for reinforcement.This is a complete course for beginners who want to learn Brazilian Portuguese! Overall, this software performed well, with very few hiccups. One little word of caution while we’re on the subject, though. While using the microphone to practice my pronunciation to match that of a Brazilian speaker, a friend of mine who happens to live in Rio de Janeiro sent me an instant message. That little act crashed my computer. If you have your entire life on your computer like I do, you may want to disarm programs like instant messaging until your language lesson is finished, or get a larger hard drive, or take stuff off of your computer to accommodate unexpected Internet interaction. My computer came right back up, thankfully. Rosetta Stone displays its help service in not one but two places that I found. The first is on the flip side of the Start card with the toll-free telephone number, and the second is at the Internet link at the lower right-hand side of the screen. Then, each lesson has the question mark icon at the lower right-hand side. The question mark icon button in the middle takes you to Rosetta Stone’s support site on the Internet. Since language and culture are so closely linked, Fairfield Language Technologies should try to obtain the same level of vivid, colorful photographs, but of Brazil itself with Brazilians in their own environment. This would let the student learn not only the language, but also geography and culture at the same time, in a setting where the language is really used. 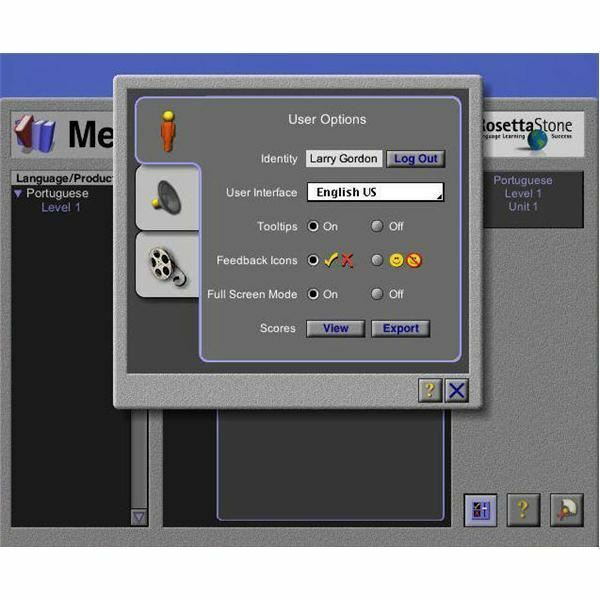 The makers of Rosetta Stone Level 1 Brazilian Portuguese obviously did a lot of research and planning, not only in delivering a blow-away course in language acquisition, but also in software innovation. Count yourself lucky if you have the chance to learn Brazilian Portuguese from this software. I would recommend this software to anyone who's ready to actively participate in learning the language.